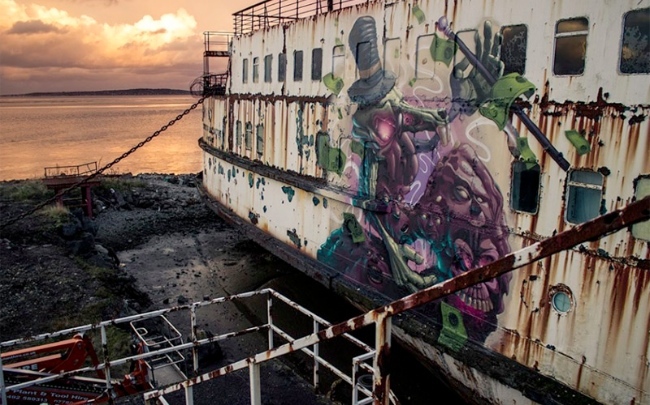 The Duke of Lancaster, a decommissioned and abandoned cruise liner shipwrecked docked off the North Wales Coastline in Wales has become the home to a range of urban artwork murals. Here are the latest pieces that came up : Mr Zero and Fatheat are part of Street Art Crew and Colored Effects Crew, a Hungarian Street Art Crew. They have made the trip to North Wales from their native Hungary, to leave their own message about corruption on the 1950s cruise liner, with their works which are titled ‘The Prophets of Profit’. 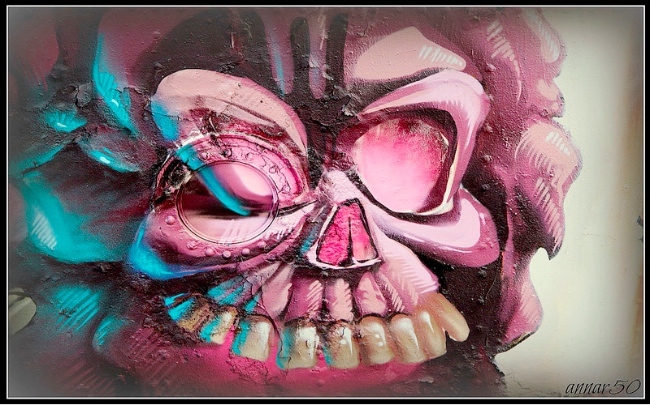 This has been split into two separate portraits which are positioned either side of Bristolian Artist Bungle’s ‘Face of Authority’ piece. Mr Zero has created a 12 x 7m pig character. 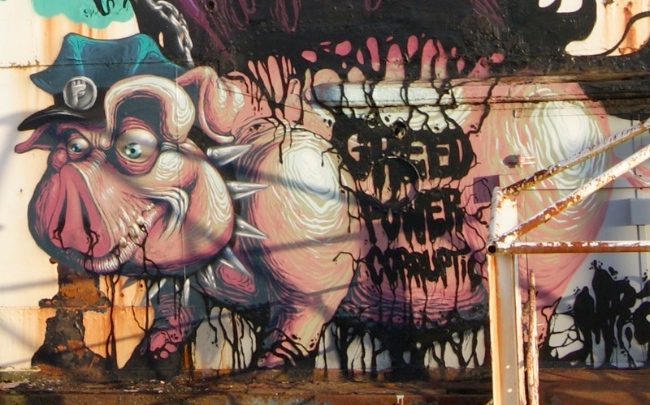 Notably he has included the council’s own logo on the pig’s hat and incorporated provocative wording: ‘Greed’, ‘Power’ and ‘Corruption’ in the character. This message is further reinforced by his partner, Fatheat’s, 12 x 9m mural, which depicts a monster character. 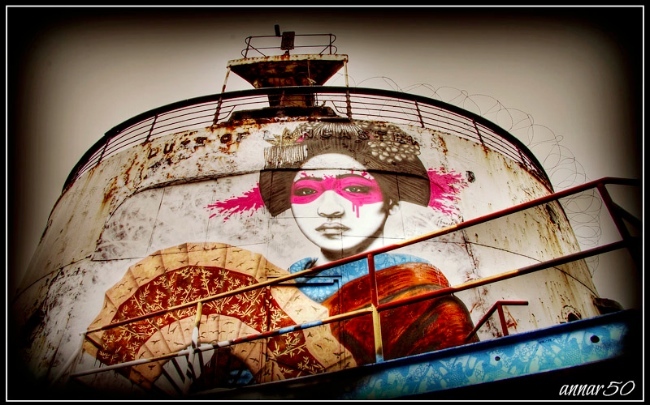 In direct contrast to these characters and the other artworks on the ship, Irish artist Fin DAC has created a beautiful image, depicting a Geisha Character. 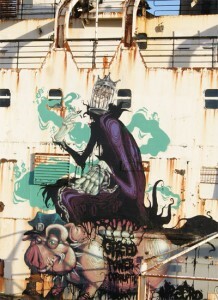 Titled ‘Mauricamai’, this painting is tucked away around the hull side of the ship. It has been purposefully positioned so it can’t be seen from the coastal path – it can only be seen if the ship’s dock is opened to the public. The ship is now home to 8 pieces of artwork, with artists travelling from all over Europe to leave their mark on this historic vessel.